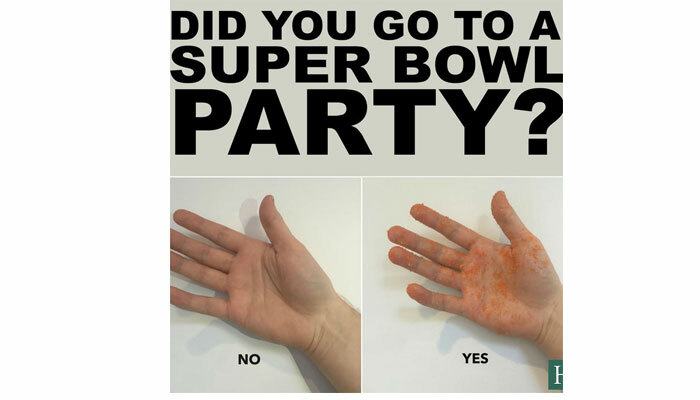 Come Monday morning, this picture is sure to be the topic of discussion as well as the newest form of “hand check” around the office water cooler thanks to the Huffington Post’s Saturday Funnies issue. And as obsessed as most of us are with the NFL Super Bowl and the ads and halftime entertainment that go with it, the odds are favoring a run on the sale of hand wipes. But since one of the Super Bowl stadium treats is a hot dog topped with gold flakes, just maybe you should “hand wipe” the hot dog instead. Then, if you eat enough of them at $12 apiece, maybe you can start a 401K. Needless to say, this week has lots of football stories on current and former NFL players Peyton Manning, Joseph Randles, Joe Montana and Kenny Stabler as well as an announced extention of the Rooney rule for women in executive positions. There have also been many on Johnny Manziel that will be covered in an upcoming blog post. But football isn’t the only sport mentioned. In ice hockey, Dennis Wideman has been suspended 20 games for flattening an official, retired soccer star Abby Wambach is dedicating her post-game career to fighting for equality, BMX star Dave Mirra has died from a suspected suicide attempt and NASCAR racing star Tony Stewart will miss the Daytona 500 due to a broken back. And for the feel-good story of the week, the little Afghani boy wearing a Lionel Messi jersey made from a plastic bag gets a real treat. All this and more – enjoy! There’s more on Peyton Manning’s hiring of his own investigators to question his accuser who alleged that HGH was shipped to the Manning home in Mrs. Manning’s name. Peyton welcomes the NFL investigation that will probably be launched following the Super Bowl. Practice squad safety Ryan Murphy has been sent home to Denver by the Broncos after he was questioned by San Jose police as part of a Tuesday prostitution sting. He was released after questioning but his brother and a suspected prostitute received citations. The team doesn’t want a distraction to reaching its goal of winning Super Bowl 50. In the latest in a string of problems with the law that include domestic disturbance shoplifting, assault on a law enforcement officer and more, former Cowboys running back Joseph Randle was arrested earlier this week on an outstanding misdemeanor warrant. Randle says this arrest marks the end of his NFL career. NFL Hall of Fame quarterback Joe Montana talks about the long-term physical damage and the pain an NFL career brings. He thought he’d retired young enough to still be active with his family but it hasn’t worked out that way. Following former Raiders QB Ken Stabler death in July from colon cancer, his brain was removed at his request and sent to Boston University researchers to be part of their ongoing study into chronic traumatic encephalopathy or CTE in former NFL players. On Wednesday it was reported that on a scale of 1-4, Stabler had high Stage 3 CTE. Trying to walk its diversity talk, the NFL will institute a policy for women executives similar to the Rooney Rule which requires NFL teams to interview minority candidates for head coaching positions. Now, when an executive position is open on a team or league level, the diverse slate of candidates interviewed will include women, according to NFL commissioner Roger Goodell. If you’re a Super Bowl fanatic and want to know more about the gold “50”, a good read comes from Bryan Curtis. The University of California-Berkley has admitted liability in the 2014 death of Ted Agu, a walk-on defensive lineman following a conditioning workout. Tony Stewart will miss the start of his final NASCAR Sprint Cup season after suffering a burst fracture of the L1 vertebra gotten in a Sunday ATV accident near San Diego. He underwent back surgery on Wednesday. X Games Bicycle Motorcross (BMX) legend Dave Mirra, aged 41, died on Thursday from an apparent self-inflicted gunshot wound. He won 14 gold medals between 1995 and 2008. Union Cycliste Internationale (UCI) has been rocked over discovery that 19-year-old Belgian rider Femke Van den Driessche, competing in the cyclocross world championships, had a motor hidden in the bike frame. She has said it wasn’t her bike but was identical to it and she was totally unaware of a motor being there. Italian bike manufacturer Wilier Triestina said it will sue Van den Driessche. U. S. Soccer filed suit in federal court against the U.S. women’s national team players association on Wednesday. This is an attempt to clarify the collective bargaining status between the two parties as the Olympic Games in Rio loom just six months away. Murtaza Ahmadi, the five-year-old boy seen wearing a Lionel Messi jersey made out of a plastic bag, has received a real FC Barcelona Messi kit and also got invited to take the field with other players at the Afghanistan Football Federation headquarters on Tuesday. He wore his plastic Messi uni made for him by his older brother over his new kit. And now Messi’s management has reached out to the federation to arrange a meeting between the boy and his hero. The NHL has suspended Calgary Flames defenseman Dennis Wideman for 20 games for knocking down linesman Don Henderson during the January 27 game against the Nashville Predators. Based on Wideman’s annual salary, he’ll also be fined $564,516.20. Mark Cuban, owner of the NBA Dallas Mavericks, has said he’s thinking of starting his own League of Legends team, in charge of all money and personnel decisions. This is in response to the growth of the eSports world that just weeks age saw former NBA player Rick Fox buying a team, Gravity, for a reported $1 million. Omara Durand, a legally blind sprinter from Cuba may run with a relay team at the 2016 Olympics in Rio. She is already the holder of a few gold medals from the London 2012 Paralympics and Qatar’s 2015 Paralympics but now wants to be part of the relay team in the Olympic Games in Rio. Last year Max Verstappen became the youngest driver to ever start a Formula I (F1) race. Before this year’s season he took the opportunity to drive an F1 car down a ski slope. Kids in India are having fun with the latest sports craze there – limbo skating. The kids on skates are able to limbo under poles just nine inches above the ground. Oral Roberts University in Tulsa, Oklahoma now requires all students to use Fitbits, the wearable fitness monitor. The university has long required all students to meet strict fitness goals as part of their “whole person education.” And students are graded on how well or poorly they do; the data becomes part of their grade in health and physical education classes. Photo from Huffington Post Funnies.